After changing stuff like mad.. finally found my setup for awhile. ^^ looks very cool !! What font ? and how that calendar pop-up ? This is probably a resized terminal with cal command. Finally switched to urxvt. It's amazing how much faster it starts compared to terminator. 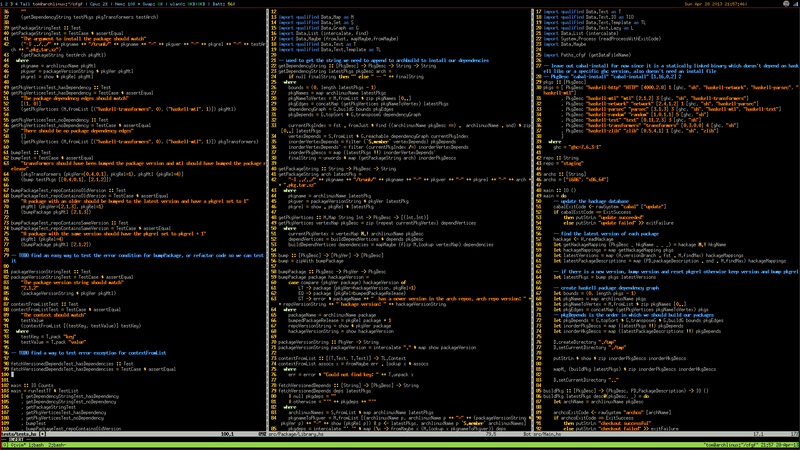 Changed color scheme to match the jellybeans vim theme. Maybe gelly from artwiz package, but I'm not sure. Oops, sorry was barely awake.. terminal font is lime from artwiz-fonts top bar is ohsnap.icons from ohsnap in AUR. Good work. It's a slick setup. @3lazer4 and @Shinryuu, where did you guys get those wallpapers? @moetunes, I like it! And nice one, @Avatar-J! Hey guys, haven't posted in a while. I've had to deal with various health issues, but things are slowly moving forward. I'm not with stumpwm anymore, I went back to ratpoison again. It's so stable and it stays out of my way. Don't care to hide your pr0n? Good to see those health issues are getting better, though.